The children’s room is on the second floor. It has been decorated as it might have been in the late 1800s. Our children’s room has many early toys that include trains, handmade dolls and china head dolls. There are early story books, a school desk and puzzles. 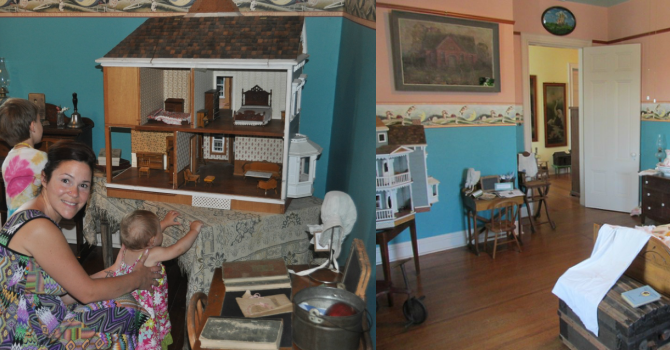 A treat for all is the large doll house which is on display. As you gaze upon the toys, handmade clothes with bright embroidery and comfy featherbed, you can feel how a child would have loved this room, looking out the front window onto the street below. Maybe a horse and carriage would have passed by or a mother and child walking to the town square to a movie at the Royal Theater.